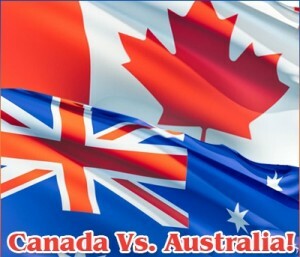 Home » Australia » Australia vs Canada: World’s Happiest Countries? In a recent ‘best places to live’ survey, both Canada and Australia were noted as strong contenders with three cities from each of the two countries being featured in the vote. We decided to put the two against one another to establish which was truly the world’s happiest country. Nicknamed ‘The Lucky Country’, there are plenty of reasons why the Aussies live such a rich quality of life. States like Sydney, Melbourne and Perth are just a handful of the more well known parts of Australia, but they are well known for a reason. For instance, Melbourne is tourist-central when it comes to having a large following of international visitors, and this is due to its breathtaking Yarra River, thriving music scene and cutting-edge architecture, not to mention its Royal Park which spans over 420 acres of lush green land. Sydney has sandy beaches, top universities, a stunning harbour (with the famous Opera House) and an overall cosmopolitan spirit which makes it one of the most sought after cities to live in Australia. Perth on the other hand is known for its remote cities and much sparser population, but it does in fact rank as being Australia’s fourth wealthiest city at the moment. If you’re a fan of the finer things in life such as the arts, boating and water sports, Perth is certainly a beautiful place to retire to. However, before you can make a decision on which is your favourite Australian city, it’s helpful to read up on the Australian visa requirements. Luckily there are professional visa consultants who are available to talk through any concerns and issues with you so that the entire moving process can run as smoothly as possible, allowing you to concentrate on the excitement of immigrating to Aussie land rather than worrying about documentation. However, competition is fierce for Australia, in the fight to be crowned the world’s happiest country. Canada is an extremely family-orientated, community-minded country to live and so it’s ideal for families looking for a new start in life. Education is important here, so once children are fully grown, there are currently 21 colleges and universities in Canada to look at, which will only continue to grow with the country’s increasing population. Also, if a job requires a lot of international travel, there are many advantages of securing employment and even immigrating to Canada permanently, including how convenient it is to travel back and forth from its 4 airports. Canada is actually the closest point to Europe than any other part of North America, making its travel system ideal for regular business trips. With such varied prospects and advantages to consider, it is little wonder that Canada and Australia have fought it out at the top of lists of the best places to live for the best part of the last decade.